1. When you really listen to your children. As I talked about in my blog, Be Present, Not Balanced: Stop Trying to Live a Well-balanced Life, it’s important to power down our phones and computers when we are with our kids. This way we are able to give our full attention and truly listen to them. 2. When your calendar is full of things to do with your children. We will pour our hearts and time into what we treasure—whether it’s your family, sports, friendships, work, or anything else. A good dad loves his kids well by spending quantity time with them. [click to tweet] For more reasons and ways to fill your calendar with your kids, listen in to my podcast How to Love Your Child Well. 3. When your son or daughter comes running to you when they get hurt. Part of being a good father means making sure your kids know that you are always there for them, no matter what. 4. When you calmly and gently discipline your children. Disciplining your children should not include yelling or screaming. Rather, it requires gentleness, consistency, and an authoritative tone as I discussed in 7 Foundational Principles of Tried and True Discipline. There’s nothing more special than sharing a few quiet moments with your kids before they drift off to sleep. Create a simple, lasting memory for you and your child by tucking them into bed each night, showing them you love them. 6. When you help your kids with their schoolwork. All too often, it’s Mom who attends parent/teacher conferences and helps the kids with schoolwork. Step up and help your children with their homework and school projects. 7. When you teach your children absolute truths. As a parent, your biggest responsibility is to instill truth into your children’s lives—truths about their Creator and truths for living. 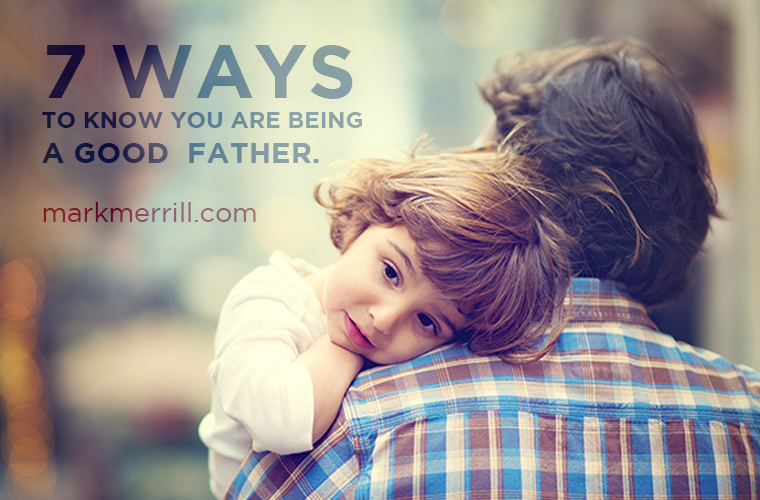 What are some ways you know you are being a good dad? Please comment below.